3½ in. (9 cm.) high; 9 in. (23 cm.) diam. Sir Harold Wernher, 3rd Bt., G.C.V.O. (1893-1973), Luton Hoo, Bedfordshire, and by descent. 1913 Luton Hoo Inventory, p. 27, no. 112, in the Grand Hall, 'in cabinet'. P. G. Coole & E. Neumann, The Orpheus Clocks, London, 1972, pp. 38-40 and 63-69, figs. 15, 31, 32, 34a and b, 36. H. Alan Llyod, The Collector's Dictionary of Clocks, London, 1964, p. 168, figs. 422-6. The Orpheus clocks form a group of eleven examples, nine of drum form such as the present Luton Hoo example, and two others of square form. The apparent maker's punch-mark MTA on the backplate has only been found on the Chicago Orpheus clock, the other nine clocks are unsigned. 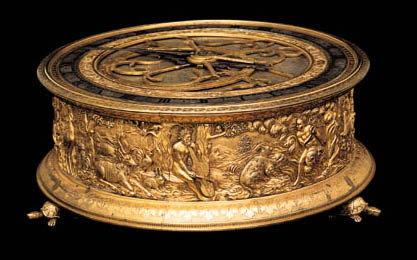 However, there is another ordinary square table clock in the Altes Schloss, Stuttgart, that bears no resemblance to the Orpheus clocks but has an identical punch. As yet no maker has been attributed to this mark. In the frieze the arts and sciences are celebrated by the legend of Orpheus, related in Ovid's Metamorphoses. Orpheus, the son of a Muse, was so marvellous a player on the lyre, that he could charm wild beasts and make even trees and rocks move by his music. He married Eurydice, a wood-nymph, who was bitten by a snake and died. The mourning Orpheus descended into Hades to recover her, and by the beauty of his music so moved the goddess Persephone that she consented to release Eurydice, on the condition that he should not look back back at his wife as they departed. However as he neared the end of his journey, Orpheus forgot the proviso, looked back, and Eurydice disappeared from him forever. In the relief he is seen playing a 'modern' violincello charming the animals; while another scene portrays Euridce emerging from Hades. Both scenes are directly derived from engravings published by the Nuremberg artist, Virgil Solis (d. 1562), illustrated in The Orpheus Clocks, op. cit., p. 108, figs. 70 and 71. The Rothschild Orpheus clock was recently sold in these Rooms, from the Collection of the Barons Nathaniel and Albert Von Rothschild, 8 July, 1999, lot 183.